Federation Commander is even more fun using pewter starships instead of the counters. The "large hex" side of the map panels will work conveniently with the Starline 2400 Miniatures provided in Border Boxes. Each major product in the Federation Commander game system is associated with three Booster Packs that provide extra ship cards, including some entirely new ships. For each set of three Booster Packs, there is a Border Box with 24 pewter starships to match the ship cards in those Booster Packs. This makes it convenient for players to buy complete sets at one time, but also provides a very economical way to build an entire fleet as you get a lot more ships for your dollar in Border Boxes than any other way. 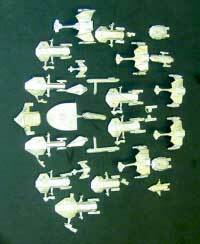 The pewter starships require minor assembly, no more than a few patient moments with some epoxy glue or super glue. You can leave them unpainted; or you can paint them in official colors. You can even make up your own color scheme to make your ships unique! Border Box #1 provides ships for Boosters #1 - #3 supporting Klingon Border; to buy, click here. The stock # is 4401; Retail $99.95. Border Box #2 provides the ships for Boosters #4 - #6 supporting Klingon Attack; to buy, click here. The stock # is 4402; Retail $99.95. Border Box #3 provides the ships for Boosters #7 - #9 supporting Romulan Border; to buy, click here. The stock # is 4403; Retail $99.95. 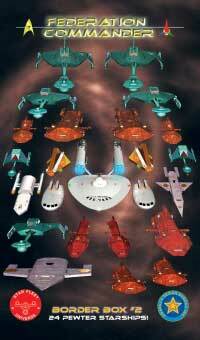 Border Box #4 provides the ships for Boosters #10 - #12 supporting Romulan Attack; to buy, click here. Stock # is 4404; Retail $99.95. Border Box #5 provides the ships for Boosters #13 - #15 supporting Tholian Attack; to buy, click here. Stock # is 4405; Retail $99.95. Border Box #6 provides the ships for Boosters #16 - #18 supporting Battleships Attack; to buy, click here. Stock # is 4406; Retail $99.95. Border Box #7 provides the ships for Boosters #19 - #21 supporting Distant Kingdoms; to buy, click here. Stock # is 4407; Retail $99.95. Border Box #8 provides the ships for Boosters #22 - #24 supporting Orion Attack; to buy, click here. Stock # is 4408; Retail $99.95. Border Box #9 provides the ships for Boosters #25 - #27 supporting Hydran Attack; to buy, click here. Stock # is 4409; Retail $99.95. Border Box #10 provides the ships for Boosters #28 - #30 supporting War and Peace; to buy, click here. Stock # is 4410; Retail $99.95.